Flying Saucers – Secret History! The Nazi UFO Mythos - Secret or Lies? 1945: Flight of the Ostara-Nazi Flying Saucer? The Sack AS 6 - The Real "Nazi Saucer?" Reinhard Gehlen and His Organization - Operation "Paperclip"
Even before the war it was becoming apparent to some aircraft designers that propeller driven aircraft were nearing the limits of their possible performance. With the world speed record smashed by the Heinkel He 100 and shortly after by the Me 209 it was clear that no matter how much power a piston-engine plane possessed it could only approach the speed of sound, an entirely new method of propulsion would be needed to achieve greater performance. Three different methods seemed possible: rocket, turbo jet and the 'ram' jet. All of these provide forward thrust by constant recoil verses the propeller which literally drags a plane through the air. A rocket motor works independent of the atmosphere carrying its own oxygen and fuel but also consuming them in a relatively short time. The 'ram' jet is simple in concept with the force of air ramming into the engine being sufficient for fuel to be introduced and ignited. The hot gases shooting through a tail pipe push the engine and the attached plane forward. Unfortunately, a 'ram' jet doesn't begin to function unless its already travelling at a decent speed, requiring a second power plant to bring the aircraft up to speed for the 'ram' jet to take over. A turbo jet is more complex requiring a rapidly spinning compressor to push enough air into the combustion chamber so the engine can generate sufficient thrust. The biggest obstacle to realizing the dream of jet powered flight was in producing a compact turbojet that gave good thrust while standing up to extreme heat and vibration. Frank Whittle in England and Hans von Ohain of Germany developed the first turbo-jet engines independent of each other. The principle of all jet engines is essentially the same. The engine draws air in at the front and compresses it. The air then combines with fuel and the engine burns the resulting mixture. The combustion greatly increases the pressure of the gases which are then exhausted out of the rear of the engine. The process is similar to a four stroke cycle, but with the processes - induction, compression, ignition and exhaust - taking place continuously. The engine generates thrust because of the acceleration of the air through it - the equal and opposite force this acceleration produces (Newton's third law) is thrust. A jet engine takes a relatively small mass of air and accelerates it by a large amount, whereas a propeller takes a large mass of air and accelerates it by a small amount. The efficiency of the process, like any heat engine, is defined as the ratio of the compressed air's volume to the exhaust volume. The advantage of the jet engine is its efficiency at high speeds (especially supersonic speeds) and high altitudes. On slower aircraft, a propeller (powered by a gas turbine), commonly known as a turboprop is more common. Very small aircraft generally use conventional piston engines to drive a propeller. The earliest attempts at jet engines were hybrid designs, in which an external power source supplied the compression. In this system (called a thermojet by Secondo Campini) the air is first compressed by a fan driven by a conventional gasoline engine, mixed with fuel, and then burned for jet thrust. Three known examples of this type of design were the Henri Coanda's Coanda-1910 aircraft, the much later Campini Caproni CC.2, and the Japanese Tsu-11 engine intended to power Ohka kamikaze planes towards the end of World War II. None were entirely successful, and the CC.2 ended up being slower than a traditional design with the same engine. The key to the useful jet engine was the gas turbine, used to extract energy to drive the compressor from the engine itself. Work on such a "self-contained" design started in England in 1930 when Frank Whittle submitted patents for such an engine (granted in 1932) using a single turbine stage in the exhaust to drive a centrifugal compressor. In 1935 Hans von Ohain started work on a similar design in Germany, seemingly unaware of Whittle's work. Ohain approached Ernst Heinkel, one of the larger aircraft industrialists of the day, who immediately saw the promise of the design. Heinkel had recently purchased the Hirth engine company, and Ohain and his master machinist Max Hahn were set up there as a new division of the Hirth company. They had their first HeS-1 engine running by 1937. Unlike Whittle's design, Ohain used hydrogen as fuel, which he credits for the early success. Their subsequent designs culminated in the HeS-3 of 1,100 lb (5 kN), which was fitted to Heinkel's simple He 178 airframe and flew in August 1939, an impressively short time for development. The He 178 was the world's first jetplane. In England, Whittle had significant problems in finding funding for research, and the Air Ministry largely ignored it while they concentrated on more pressing issues. Using private funds he was able to get a test engine running in 1937, but this was very large and unsuitable for use in an aicraft. By 1939 work had progressed to the point where the engine was starting to look useful, and Whittle's Power Jets Ltd. started receiving Air Ministry money. In 1941 a flyable version of the engine called the W.1, capable of 1000 lb (4 kN) of thrust, was fitted to the Gloster E28/39 airframe, and flew in May 1941. One problem with both of these early designs was that the compressor works by "throwing" air outward from the intake to the sides of the engine, where the air is then compressed by being "crushed" up against the side. This leads to a very large cross section for the engine, as well as having the air flowing the wrong way after compression - it has to be collected up and "bent" to flow to the rear of the engine where the turbine is located. Anselm Franz of Junkers' engine division (Jumo for Junkers Motoren) addressed this problem with the introduction of the axial-flow compressor. Essentially this is a turbine in reverse. Air coming in the front of the engine is blown to the rear of the engine by a fan, where it is crushed against a set of non-rotating blades called stators. The process is nowhere near as powerful as the centrifugal compressor, so a number of these pairs of fans and stators are placed in series to get the needed compression. Even with all the added complexity, the resulting engine is much smaller. Jumo was assigned the next engine number, 4, and the result was the Jumo 004 engine. This was the first jet engine to see service, when it powered the Messerschmitt Me 262 in 1944. The Messerschmitt 262 was by far the fastest airplane of WW II. Mass production started in 1944, too late for a decisive impact. After the end of World War II, the German Me 262 aircraft were extensively studied by the victorious allies, and led to early Soviet and US jet fighters. British engines also were licensed widely in the US. American designs wouldn't come fully into their own until the 1960s. Their most famous design, the Nene, would also power the USSR's jet aircraft after a technology exchange. 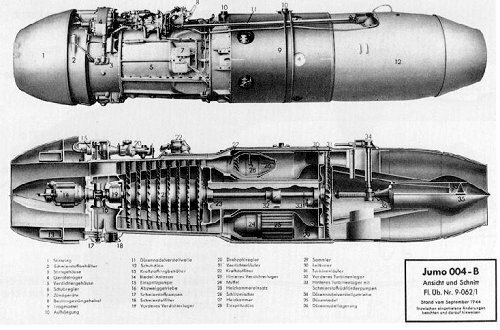 Whittle's and von Ohain's designs are now classified as turbojets, mostly to distinguish them from some of the types outlined below. Generally turbojets are arranged around a central shaft running the length of the engine, with the compressor and turbine connected to the shaft at either end. In the middle is a combustion area, typically in the form of a number of individual "flame cans" which are used to stabilize the combustion. Like all heat engines, the efficiency of a jet engine is strongly dependent upon the temperature of the exhaust gas -- a higher temperature means more energy from the fuel. As shown by the ideal gas law, temperature and pressure in a gas are inversely related. A simplification is to compare the pressure of gas taken in to when it is burned, the so-called compression ratio. Early jet engines had compression ratios as low as 5 to 1, compared to an otto cycle engine at anywhere from 6 to 1, to 9 to 1. The limiting factor is the temperature at the front of the turbine; increasing the compression ratio means that there is considerably more fuel/air mixture (the charge) burning in the flame cans, and a higher temperature. If the temperature in the engine gets too high, it can melt or burn the materials used to build the engine. This is primarily a problem when taking off; as the aircraft climbs the ambient pressure drops and the compressor can be run at higher ratios. German engines had serious problems in this regard. Their early engines averaged only 10 hours of operation before failing--often with chunks of metal flying out the back of the engine when the turbine overheated. British engines tended to fair much better due to better metals. For a time some US jet engines included the ability to inject water onto the engine to cool the exhaust in these cases. This was particularly notable because of the huge amounts of smoke that would pour out of the engine when it was turned on. Today this problem is no longer a concern. Better materials have increased the critical temperature, and automatic throttle controls have made it nearly impossible to overheat the engine. However, the most effective solution has been to bleed off some of the air from the compressor, run it down the shaft, and blow it through the middle of hollow turbine blades. This made the blades quite expensive to build. The quality of these bleed systems has continued to improve to the point where the latest Rolls-Royce Trent designs operate at a compression ratio of 44:1, considerably better than piston engines. The compressor uses up about 60 to 65% of all of the power generated by a jet engine. This explains why they aren't used in cars: the engine would be burning the fuel needed for a race while sitting still at a red light. Every bit of efficiency in running the compressor is needed, so one common design technique is to use more than one turbine to drive the compressors at various speeds. Most such designs that use two stages are are known as "two spool" engines. A few have used three stages. Given that 60% of the engine's power is being used for driving the compressor, one option for better efficiency is to do less compression - that is, make a smaller engine. This seems self-defeating, but it's not the case. If the engine uses some of that energy not to compress the air, but to push it, it can generate thrust without compression. By adding another turbine stage to the engine, all of the jet exhaust can be used for rotary force rather than jet thrust. Coupling this second (or third) turbine to a propeller makes for a very efficient engine due to the inherent efficiency of a propeller at low speeds. This is called a turboprop, and can be found on many smaller commuter planes, cargo planes, and helicopters (where it is often known as a turboshaft). Propellers lose efficiency as aircraft speed increases, which is why they are not used on higher-speed aircraft. Similar engines are used for many applications. Connected to a generator, they make excellent light-weight and very reliable power sources. In fact, almost all large aircraft include a much smaller engine to provide power while parked at the airport, called an auxiliary power unit. The small pop-up doors often visible near the tail of an airliner are the air vents for these engines.. Larger versions of the same design are found in many industrial applications, peak-demand power generation stations, and military ships. If the propeller is better at low speeds, and the turbojet is better at high speeds, it might be imagined that at some speed range in the middle a mixture of the two is best. Such an engine is the turbofan (originally termed bypass turbojet by the inventors at Rolls Royce). Turbofans essentially increase the size of the first-stage compressor to the point where they act as a ducted propeller (or fan) blowing air past the "core" of the engine. This type of engine runs best from about 250mph to 650mph, which is why the turbofan is by far the most used type of engine for aviation use. The bypass ratio (the ratio of bypassed air mass to combustor air mass) is an important parameter for turbofans. Early turbofans (and most modern jet fighter engines) are low-bypass turbofans with bypass ratios less than 1. However, the "large mouthed" engines on almost all modern civilian jet aircraft are high-bypass turbofans which generally have bypass ratios of 3 or more. Turbofans (especially high bypass engines) are fairly quiet. The noise of a jet engine is strongly related to the temperature of the air coming out the back. In the turbofan this hot air is mixed with the cold air bypassing the engine, so the result is a much lower temperature. Jet aircraft are often considered loud, but a conventional piston engine delivering the same tens of thousands of horsepower would be much louder. The reason propeller engines lose efficiency at high speed is the same reason that airplanes find it difficult to fly at supersonic speeds: an effect known as wave drag significantly increases drag just below the speed of sound, and led to the concept of the sound barrier. In the case of a propeller this effect can happen any time the prop is spun fast enough that the tips of the prop start travelling near the speed of sound, even if the plane is sitting still. This can be controlled to a large degree by adding more blades to the prop, using up more power at a lower speed. This is why most WWII fighters started with two-blade props and were using five-blade designs by the end of the war. As their engines increased in power, they couldn't just spin the prop faster. However this solution does not help as the plane itself accelerates; at some point the forward speed of the plane combined with the rotational speed of the propeller will once again result in wave drag problems. A method of decreasing wave drag was discovered by German researchers in WWII: sweeping the wing backwards. Today almost all aircraft designed to fly much above 450 mph (700 km/h) use a swept wing. In the 1970s NASA started researching propellers with similar sweep. Since the inside of the prop is turning more slowly than the outside, the blade became progressively more swept toward the outside, leading to a curved shape. Propfans are turbofans without ducts. The ducting of the normal turbofan has the side effect of containing the sonic boom of the fan inside the engine where it is largely muted. Such is not the case on a propfan. Propfans were at one time thought to be the next logical step in engine development for subsonic aircraft, but their very high noise levels made them unattractive, and work on them has since stopped. Propfans are also known as ultra high by-pass (UHB) engines. At the other end of the scale from the increasing complexity of the fans is the ramjet. When air enters a jet engine its speed decreases and its pressure increases, called the ram compression effect. At high speeds this process can be fairly effective, and can compress enough oxygen to efficiently burn the fuel for the engine all on its own. Typically the speed needed to make this process work effectively is above 600 mph (1000 km/h), and doesn't outperform traditional designs until supersonic. Ramjets are built to utilize this compression effect through a careful inlet design. Beyond that the engine is largely nothing more than a well-designed tube. A ramjet thus contains no (major) moving parts and is particularly useful in applications requiring a small and simple engine for high speed use. On the downside they need to be flying at high speed to start with, making them less than useful for general tasks. They have found use almost exclusively in missiles, where they are boosted to operating speeds by a rocket motor, or by being attached to another aircraft (typically a fighter). Today ramjets have been generally replaced by small turbofans or rockets. The pulsejet was invented in the first half of the 20th century and was the power plant that propelled the world's first cruise missile, the German V1 flying bomb. Like most jet engines, the pulse jet engine is very simple in design -- consisting primarily of a long tube into which air enters and is mixed with fuel to create a combustible (stoichiometric) mixture. Where the pulsejet differs from other engines such as the Turbojet or Ramjet is that the combustion inside the engine is not continuous but occurs in the form of repeated explosions, hence the name "pulsejet". There are two basic types of pulsejets. The first is known as a valved or traditional pulsejet and it has a set of one-way valves through which the incoming air passes. When the air/fuel is ignited, these valves slam shut which means that the hot gases can only leave through the engine's tailpipe, thus creating forward thrust. The second type of pulsejet is the valveless pulsejet. These engines have no valves; indeed they have no moving parts at all and in that respect they are even simpler than a ramjet. With these engines, the intake and exhaust pipes usually both face the same direction. This often necessitates bending the engine in half (the Lockwood design is made this way) or placing a 180 degree bend in the intake tube. This is necessary because when the air/fuel mixture inside the engine ignites, hot gases will rush out both the intake tube and the exhaust tube, there being no valves to stop them. If both tubes weren't facing in the same direction, little or no thrust would be generated because the reactions from the intake and exhaust tubes would cancel each other out. The advantage of the valveless pulsejet is simple and obvious, there are no moving parts to wear out so they are far more reliable and a lot simpler to build. However, despite this advantage, pulsejets are seldom considered to be practical power plant due to their high fuel consumption, noise, and significant vibration levels. Today, they survive as a powerplant for model aeroplanes. When the air inside a ramjet exceeds the speed of sound (meaning an aircraft speed of around Mach 5+) combustion fails to occur properly. This is overcome in a scramjet (supersonic combustion ramjet). Scramjets are a new concept still in the research stages. Usually, the inlet is much wider (typically the entire underside of the craft) so the compression is less and the air remains at supersonic speeds. Some designs use reactive chemicals or gases other than standard jet fuel. Normally, the design of the jet is much more complex. Like a ramjet the scramjet must already be moving extremely fast before it will start working, but theoretically, speeds in excess of Mach 20 are possible. Rocket engines need to carry both their fuel and "air, which makes them carry around much more weight than a jet for the same amount of fuel burned. The turborocket is an attempt to reduce the amount of oxygen (or to be exact, oxidizer) that needs to be carried by extracting some from the air the rocket flies through. Typical designs use a compressor similar to that of a traditional jet engine, but mix that along with additional oxidizer from the tanks. The compressor is turned off when reaching altitudes where there is no longer enough air to make this practical. Note that there are several other systems for extracting oxider from the air as well, designs known as LACE. For subsonic aircraft, the air intake to a jet engine presents no special difficulties, and consists essentially of an opening which is designed to minimise drag, as with any other aircraft component. However, the air reaching the compressor of a normal (not scramjet) jet engine must be travelling below the speed of sound, even for supersonic craft. Special intakes are used to ensure this. The earliest types of supersonic aircraft featured a central shock cone used to form a shock wave ahead of the air intake. Being behind the shockwave, the air was travelling subsonically. This type of shock cone is clearly seen on the English Electric Lightning and MiG-21 aircraft, for example. The same approach can be used for air intakes mounted at the side of the fuselage, where a half cone serves the same purpose with a semicircular air intake, as seen on the F-104 Starfighter and BAC TSR-2. A more sophisticated approach is to angle the intake so that one of its edges forms a leading blade. A shockwave will form at this blade, and the air ingested by the engine will be behind the shockwave and hence subsonic. The Century series of US jets featured a number of variations on this approach, usually with the leading blade at the outer vertical edge of the intake which was then angled back inwards towards the fuselage. Typical examples include the Republic F-105 Thunderchief and F-4 Phantom. Later this evolved so that the leading edge was at the top horizontal edge rather than the outer vertical edge, with a pronounced angle downwards and rearwards. This approach simplified the construction of the intakes and permitted the use of variable ramps to control the airflow into the engine. Most designs since the early 1960s now feature this style of intake, for example the F-14 Tomcat, Panavia Tornado and Concorde. We can take a look at the potential powerplants that could\would\were used on German disc-shaped aircraft. What were the general demands? High power output, light weight, size and maximum speed that could be achieved. The most common powerplant of the time. Many companies such as Daimler-Benz, Heinkel, Siemens-Halske, BMW and Argus produced piston engines of high horsepower ratings, novelties like super- and turbocharging as well as fuel injection got the performance up dramatically as well as reliability. The disadvantage was relatively large weight, many critical demands such as cooling and air for combustion, as well as the ability to only work in the atmosphere and only axial output meaning that piston egines were arrested by propellers and fans. Aircraft powered by piston engines had a top speed of around 800-900 kmph and even that was the most upper limit for record-breaking aircraft even today. This kind of engines used the atmosphere around them in which they burned usually diesel fuel to make huge amounts of thrust. Turbojets were used on the worlds first torbojet fighter the Messerschmitt 262, which was also the world`s first supersonic aircraft. The turbojets opened the gates to high-efficiency supersonic flight, but were limited to just over 1 Mach during WW2, and like piston engines were limited by working only in the atmosphere, thus an aircraft powered by them would never go orbital or in space. They could be fitted anywhere, had a very light weight and a relatively better output than piston engines, however shaft power could be extracted. Ramjets were like turbojets, but with no moving parts and a maximum theoretical speed of 25 Mach, but Germany experimented with subsonic ramjets only. These are the only known powerplants to achieve high supersonic speeds in WW2 Germany. The engine that powered the A4 produced 25 tons of thrust. This engine is the only one that had the potential to launch anything into space, and the only engine that could actually operate in space. UFOs may be scout craft from an interstellar mothership. UFOs may have come here through a "door" from another dimension or from a hidden location somewhere on Earth, within the Earth or from under the sea. But there is a common denominator: most UFOs appear to be aircraft rather than spacecraft. We know and we can infer from the personnel that worked at the projects, that the German flying discs were equipped with turbo-jets. Their motion was like that of a frisbee: it spins and at the same time it moves forewards. How, apparently nobody knows, or does not wish to say. The V-7 could be used only for short missions, since it had to carry its own gas fuel for the propulsions, unless they used the air technology with which in 1940 the Italian had attained tremendous speeds: the air is fed in by the moving craft; it does not have to be carried in the crafts.